This is part two of a series of posts on how to make a crystal grid start to finish. This is a description on how to start your crystal grid and follows the process through to completion. WHAT IS THE PROCESS OF ACTUALLY CREATING A CRYSTAL GRID? I’m going to describe a few possibilities, and then you take that knowledge and use your imagination. The sky is the limit ! To prevent reinventing the wheel, in this blog post I am going to simply describe how to create your representative grid, and you apply the knowledge from the post on programming to flesh out the “how to”. Intuition is of utmost importance in the process of gridding. If you simply feel, or know, that a particular crystal needs to be facing in a certain direction, or needs to be included in the grid, then by all means, listen to that guidance. You may be receiving it from your Higher Self, a Spirit Guide, or more likely, from the crystal itself. Follow the guidance you are given. You don’t have to know why you are doing it, you don’t have to have this all planned out by degrees and angles and quadrants. Your gut is your best guide; listen to it. 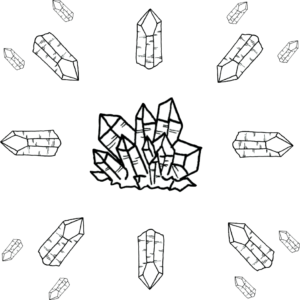 You are also not limited to only using quartz crystal in your grids. Adding other gemstones is a wonderful idea, and the amplification qualities of the quartz ramps up the metaphysical qualities of your other chosen gemstones. Before you do anything in constructing your grid, you must decide what you are gridding for and become very clear on the energies you would like to manifest. As with the instructions on programming, less is more and clarity is of utmost importance. You begin, then, with your focused intention toward a specific goal or energetic result. Once you have your grid purpose in mind, in the initial creation of your crystal grid, before you make it, you need to connect with the crystals. 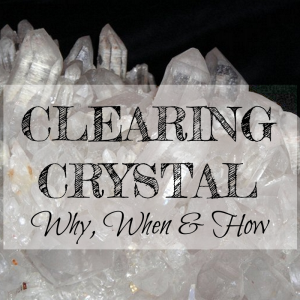 Follow this link for a detailed description on connecting with your crystal. You don’t have to hold each one and go through the entire process individually (unless you want to do this, and that is fine, too!). Select the crystals you want to use in your grid, and connect with them as a group. You will be working with them collectively, so this is a better idea than individually connecting, anyway. If you don’t have a lot of small crystals to make a grid, I offer grid sets of 16 or 32 crystal points grouped by size and energy. If you have specific intent for specific areas (for example, inside individual rooms or specific areas on your property), then, by all means, program these specific crystals individually, and then place them in the appropriate area of your representative grid. Remember to cleanse and clear your crystals first, then clearly visualize the intent and goal that you have for the grid. Next, ask the crystals to hold that intention for you; that is programming the grid. Finally, offer your thanks and gratitude for their continued assistance. Follow the suggestions from the lunar phase description from the previous blog post. Pay more focused attention during the ‘change of the guard’ as it were (New Moon and Full Moon dates). Daily, in between the phases of the moon (during waxing [growing] and waning [shrinking]), focus on the energies you want your grid to help increase or decrease. This doesn’t have to take a lot of time. It is touching in, to let your crystals know your intention is to still run the energy through the grid. Don’t forget to cleanse (to remove accumulation of negative energies) and charge (like charging a battery) the crystals periodically. Also touch base to reconnect and reaffirm your intention within the grid. Watching the moon phases may help you to keep track of what to do, when. If you aren’t sure, anytime there has been conflict or intense negative energy (fights with family members, intense sadness, etc) is a good time to cleanse your grid. Cleansing can be done without moving or deconstructing the grid. However, during an energetic cleansing, you might want to take some time to physically cleanse by dusting the crystals and the grid. As for charging to replenish energies, full moon is a great time. Use your etheric cord connection to reinforce your grids throughout the month. 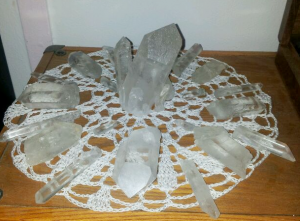 How long do you keep a crystal grid running? As long as you want! You may find that #1 your desired result has been achieved, #2 your original focus has changed or #3 you aren’t seeing any movement with the desired result (your grid just doesn’t seem to be working). If your desired result has been achieved, there is no longer a reason to continue running the grid (if it is for attaining a short term goal such as manifesting a specific issue). If this has happened, congratulations! Thank your crystals for their hard work. Feel free to deconstruct your grid with gratitude and thanks. (Deconstructing your grid can simply be thanking the crystals and taking the grid apart, returning the crystals to a shelf or ?) These crystals can be cleansed, cleared and reprogrammed for your next grid idea. As you work with your grid, you might find your original focus has changed. As you work with the energies of your grid you may find that areas which you were initially focused on soften and other areas which you hadn’t considered crop up. Reconnect with your grid, change the programming to fit your new goals or desires and continue. If you get the sense that a certain crystal in the grid isn’t meshing with the others, remove it and add a different one. Listen to your gut and follow the promptings of your intuition. WHAT IF THE GRID JUST DOESN’T SEEM TO BE WORKING? Conversely, if you aren’t seeing any movement at all toward the desired result: Ask yourself some questions, and be honest with yourself in your answers. If your grid is for manifesting something specific (not a general energetic lift), it is important to narrow the focus to one or just a few main desires. Were you clear and specific with your original grid intent? Try refocusing your intent and reprogram with more clearly defined parameters. It is vitally important that you are concise and specific when programming your grid. This requires you to become crystal clear (no pun intended) on your desired outcome (not how to get there, but the end result). Sit with your grid and decide if you were specific enough with your original grid intention and programming. Wishy-washy or overly scattered directions can get you off track from your original destination. Also, too many divergent ideas can weaken the focus of a crystal grid, in effect dissipating the energy and end result. Although it seems opposite to what I have just said, it is also possible to be TOO specific (in a certain way). For example, you may say “I want XYZ to fall in love with me”. Or “I want that specific car and only that car”. This takes the reigns from the Universe and narrows the possibility of grid success. Why is that? With asking that a specific person fall in love with you, the Universe may know that XYZ isn’t the match you hope, and that the perfect match (whom you might never suspect) is just waiting around the corner. It also interferes with XYZ’s free will so the grid will not work. In the example of gridding for THAT specific car, house, fill-in-the-blank, the same may hold true in that there may be an even better choice you hadn’t considered or didn’t even know existed. In these cases it is better to be more generally specific (don’t name names, instead name desired outcomes). This would look like “a companion who makes me laugh and makes me feel loved” or “a dependable car that is perfect for me” etc. DID YOU MAKE THESE CHANGES AND STILL NOTHING HAPPENS? What if you have made all these changes toward a specific grid goal but still nothing happens? Sometimes what you are asking to manifest isn’t in your highest good and the grid will not produce the outcome you imagine it should. Let go of preconceived ideas and be open to seeing other possibilities which may present. As an example, if you grid to “get pregnant”, what if (unbeknownst to you) it is not possible for you to get pregnant? Instead a more successful grid statement might be “to have a child come into my life”. This would expand the possibilities to include avenues through with you might have a child come into your life, not via your own pregnancy (adoption, a mate with a child entering the picture, fostering, etc). I hope this post about your crystal grid start to finish has been helpful. Constructing a crystal grid should be fun and not stressful. There are no hard and fast rules, just guidelines to follow if you need them. Follow your gut and use your creativity. For the best results, the only imperative is that you are clear about your grid purpose and concisely narrow your focus. The next and final blog post of this series has some ideas for different areas in which to employ a crystal grid. Happy gridding! Tagged grids. Bookmark the permalink.